One more from the Valley of Fire. 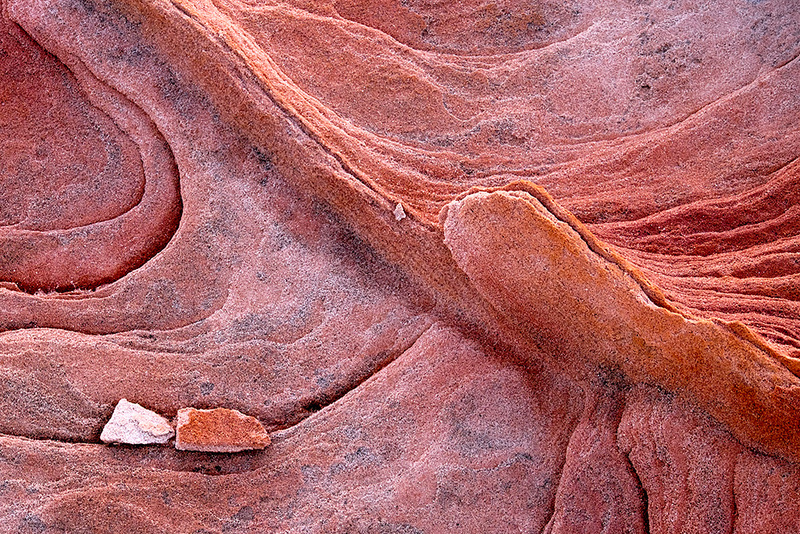 The other two Valley of Fire rock abstracts seem to be about the colors and tones while this one, for me, is all about the lines and shapes. To start a conversation though, I am interested in your thoughts about the two stones at the lower left as well as the small pebble in the very center of the image. Knowing you, I am sure they are not there randomly. What were your thoughts about leaving them in or removing them before the shot (and putting them back if so inclined….I don’t mean to imply that one should chip out rock that is attached, but these look unattached)? A valid and good question Howard. For me the pebbles add to the story of the fragile landscape. And if truth be known… I did (on another scene) try and move a pebble and it left a very distinct mark behind which I found more offensive than the rocks. I too am curious what others will think about them now. Thanks for your comment and good question Howard. I can certainly see how it adds to the story and turns it from an abstract to perhaps an abstract with a message. I was interested in your thoughts as you put this together. In fact, I like the fact that the two rocks are of reasonable size, as that is what really makes the statement. I guess what I am trying to say is that it gets one thinking about the message because they are large enough that their inclusion was clearly intentional and not an oversight. I guess that is what good image making is about…getting people to think. It will be interesting to hear other’s thoughts if they chime in. Thanks John! The amazing beauty of sandstone. How layers are taken away, yet other layers and objects remain. Artistic natural archeology. As with tide pools and high-and-low tides at the sea, many objects and things come-and-go or become embedded into place. The mystery, beauty and artistry that awaits for those that dare to see beyond a vast scene and focus on the smaller pictures or slices of the pie that are before us. Great find and capture JB! The stones add great perspective, depth, scale, balance and movement to this image. BTW: This makes an awesome b&w as well!